The scope of work typically includes the development of collateral or investor-marketing materials such as investor decks, a business plan and/or placement memorandum, financial projections and models, etc. It is not unusual for a fundraising consultant to help management articulate strategy and assist with certain business development initiatives to make the company more compelling for prospective investors. Consultants are also often tasked with defining the prospective investor universe, initial investor outreach and the management of follow-ups, term sheet review, and documentation of the final deal terms. A consultant is typically compensated in cash over a period of time (hourly, daily, weekly, monthly, etc.). The compensation may involve certain baseline thresholds, regardless of the effective time commitment. The terms are defined at the outset of the engagement and spelled out in an agreement. Both brokers and dealers must register with the SEC and join FINRA, a self-regulatory organization which administers licensing of securities professionals. Individuals who pass the licensing exams can legally receive compensation for transactions involving the sale of securities and, therefore, be lawfully compensated if a transaction successfully closes (i.e., via a success fee). While, intuitively, these definitions seem to apply to publicly-listed companies, the securities laws in the US have jurisdiction over selling securities by private startups through private processes. Therefore, private capital raises are also regulated by the SEC and those executing such transactions must be properly licensed and registered. Remuneration of BDs frequently involves retainers. The size and frequency of retainers are not uniform and involves a significant amount of negotiation between the client and the service provider. The other key feature of a BD’s compensation is a success fee. Such fees vary and typically are expressed as a percentage of the total proceeds of the financing. It is not unusual for the success fee to include equity in the company. Both act as agents on the client’s behalf, in that they represent the client when interacting with investors. However, agents cannot make decisions on behalf of the client, which means that consultants and BDs can negotiate transaction terms, but cannot officially agree to them. Both consultants and BDs may often be driven by self-interest in making as much money as possible from the engagement. This may mean extending the consulting relationship for longer than is truly needed, or getting any deal done regardless of whether it’s the best deal. Both are likely to work on multiple engagements at a time. Finally, neither consultants nor BDs work in long-term alignment with the company. A primary difference is available resources. A fundraising consultant most often is a one-person show. A broker-dealer is typically an organization with a wider breadth of expertise across several fields. A consultant will most likely be doing the work herself, while with BDs, it is not unusual for more junior team members to become the primary contacts and drivers of a deal. The most striking difference is compensation. Consultants can’t legally be compensated on a success basis, while BDs can (and most prefer this comp structure, as it allows them to command higher fees). Hiring a fundraising consultant means being able to select a very highly customized skill set. Moreover, working with a consultant means having direct interaction with senior-level talent. Other benefits of consultants include the transparency of costs and ubiquity of the resources they bring to the table. Costs are fairly visible in real time—they are capped by the number of hours (or some other measure of work), and they tend to be lower in absolute dollar terms than success fees. Smaller clients can rely on fundraising consultants as a flexible human resource to help with non-fundraising tasks. Among the meaningful drawbacks of working with a fundraising consultant is the cash cost. Consultants tend to be expensive hires compared with traditional employees (as much as 3x more expensive). Cash payments are also not tied to success, and there is no refund if the consultant is unsuccessful. Another drawback relates to unproductive onboarding time. Every consultant has to invest time in learning about the company’s history, culture, and management working style. And the company has to carry the expense of this less than fruitful period of the engagement. Lastly, in many cases the relationship with a consultant is non-exclusive. Therefore, it is not unusual for the consultant to service other clients. The consultant’s dedication may be hard to enforce. Most broker-dealer firms are fairly sizable operations. Even small BDs tend to have several professionals on staff. This can be a significant benefit since the breadth and depth of experience brought to the table are relatively large. Moreover, the strong reputation of a BD can add credibility to the capital raise. Working with a BD, a company can reasonably expect to have a wider investor outreach. Two or three people on a deal team can reach more investors within a given time frame relative to one fundraising consultant. Moreover, because BDs maintain regular contact with investors on multiple deals, they may get their calls returned quicker and get to pitch investors live (vs. a voicemail). Fundraising consultants, who work on only a few deals per year are unlikely to have such influence over investors. Institutional BDs are, however, fairly sophisticated in marketing themselves. They tend to master twisting performance and league table stats to show themselves in a more positive light. Moreover, BDs may rely on individual star performers to sell themselves to the clients, but the execution is delegated to junior professionals. Another downside of working with a broker-dealer is frequent lack of flexibility in marketing and/or deal structures they take on, even though they may claim that their solutions are tailored to each client’s individual circumstances. The BD’s business model is based on flow—the more transactions executed, the more fees they earn. BDs’ engagement letters often come with clauses that would implicitly give broker-dealers a meaningful say over a choice of financing structure. These include exclusivity clauses, tails, and ROFRs. Generally, working with BDs is expensive. In addition to the retainer, cash, and equity success fees, tails and ROFRs may commit the client to the banking relationships for years to come. A vast majority of startups and early-stage companies face the inevitability of raising capital, which often means turning to outside professionals for help. The most common figures associated with fundraising advice/help are fundraising consultants and broker-dealers. There are many similarities between these two figures, but also some important differences, and as such, it is important for startup founders to understand what these differences are and in which situations either of the two is appropriate. To this end, this post will provide context and explore various features of working with both service providers. It will also review the pros and cons of working with each and go over some successes and failures from real life where one type of service provider worked out better than the other. N.B. A Google search for “fundraising consultant” typically produces results associated with raising money for political, non-profit, or educational institutions or causes, which are often in the form of donations. For the purposes of this post, we will be focusing on fundraising consultants that deal with projects where capital donors contribute funding in anticipation of financial returns. There are also consulting organizations (e.g., McKinsey, Bain, BCG, etc.) that can sometimes conduct capital raising campaigns. However, this post is about individual (often freelance) consultants. The definition of a fundraising consultant is straightforward: A person whose end-goal is to raise money for a company. The scope of work typically includes the development of collateral or investor-marketing materials. These include documents such as a teaser or executive summary, a business plan and/or placement memorandum, and management presentation (a.k.a. pitch deck). Other deliverables include financial projections, models, and valuation analyses. Organization and management of a data room are often also included in the scope of work. It is not unusual for a fundraising consultant to help management articulate strategy and assist with certain business development initiatives to make the company more compelling for prospective investors. Consultants are also often tasked with defining the prospective investor universe, initial investor outreach and the management of follow-ups, term sheet review, and documentation of the final deal terms. Despite the above, the consultant ultimately only advises the management team, and it, therefore, falls on the founders or the executive team to drive the capital raising process toward successful completion. A consultant is typically compensated in cash for her work over a period of time, whether it be an hour, a day, a week, or a month. The compensation may involve certain baseline thresholds, regardless of the effective time commitment. The terms are defined at the outset of the engagement and spelled out in an agreement. Hourly rates differ among consultants depending on their experience, track record, and overall availability as well as their location. Hourly rates can vary from as low as $30 per hour to $150 per hour. Weekly or monthly rates are often tied to hourly rates through enforcement of a minimum number of hours. For example, a weekly rate for a $150/hour consultant is $6,000 ($150 x 40 hours) and monthly is $24,000 ($6,000 x 4 weeks). The highest monthly individual consulting rates I’ve seen are around $50,000. It is fairly unusual for companies to pay their consultants bonuses unless they want to incentivize them to perform and execute specific milestones, although it may be unlawful to tie the consultant’s compensation to certain success-related events (see broker-dealer section below). Both brokers and dealers must register with the SEC and join FINRA, a self-regulatory organization which administers licensing of securities professionals. Historically, financial service providers emerged to act as both brokers and dealers, hence why the two have been combined to the figure of “broker-dealer” or “BD.” Individuals who pass the licensing exams (known as “Registered Representatives”) and maintain affiliation with registered broker-dealers can legally receive compensation for transactions involving the sale of securities and, therefore, be lawfully compensated if a transaction successfully closes (i.e., via a success fee). While, intuitively, these definitions seem to apply to publicly-listed companies, the securities laws in the US have jurisdiction over selling securities by private startups through private processes (unless certain exemptions are met). Therefore, private capital raises are also regulated by the SEC and the persons executing such transactions must be properly licensed and registered. In 2017, there were 630,132 registered representatives associated with 3,726 BD firms in the United States. Broker-dealers can be large, highly sophisticated securities firms such as Fidelity, Charles Schwab, or TD Ameritrade, or full-service investment banks such as Goldman Sachs, JP Morgan, or Morgan Stanley. But they can also be smaller regional firms with just a few employees. The scope of responsibilities of a BD is very similar to what a fundraising consultant delivers for a startup. The process of “sale of securities” is essentially the process of “raising capital” and, therefore, BDs assist companies in preparation of proper marketing and due diligence materials. A major distinction between BDs and fundraising consultants involve compensation. The remuneration for BDs frequently involves retainers. The size of the retainers and the frequency of retainers is not uniform and involves significant amounts of negotiation between the client and the service providers. While BDs may claim that retainers are there to cover their fixed costs during the time required to execute the transaction, they may choose to forgo the retainer altogether if they deem that the client is desirable enough or believe they can get a deal done quickly. I’ve seen retainers for early stage and growth companies run from $10,000 to $150,000 and be a one-time payment at the signing of the engagement letter or a monthly occurrence for the duration of the capital raising assignment. High retainers are usually credited against the success fee (see below). The key feature of a BD’s compensation is a success fee. Such fees vary and typically are expressed as a percentage of the total proceeds of the financing. It is not unusual for the success fee to include equity in the company. Success fees are calculated as the fee rate multiplied by the proceeds in the capital raise before any expenses. For example, a 5% success fee on a $5,000,0000 raise will result in a $250,000 success fee to the BD. Success fee rates may range from low single-digit percentage points to low teens. The total size of the offering and the targeted total compensation figure play key roles in determining the rates. Most BDs will target at least $250,000-$300,000 for the total compensation for a deal and target several million through the duration of the relationship, which may involve several capital raises, M&A deals, or advisory engagements. I’ve seen a lot of success fee rates for fundraising engagements in the 4% to 8% range. Finally, equity compensation for capital raising is also a part of the equation. Rates are typically the same, or slightly lower than, the cash success fee, but this is hardly a rule of thumb. Such compensation is in the form of warrants (options to buy securities of the company on the same terms or at a slight premium as was offered in the transaction, for a period of about five years). For example, if the company sells 100,000 shares in the offering and BD has a 5% warrant, the BD will be issued 5,000 warrants if the warrants are in-the-money when the BD chooses to exercise. There are obvious similarities between fundraising consultants and BDs. For example, they both act as agents on the client’s behalf in that they represent or serve as a face for the client when interacting with investors. However, agents typically do not make decisions on behalf of the client, which means that, in the fundraising context, both the consultant and the BD can negotiate transaction terms, but they cannot agree to the terms without proper authorization from the client. Similarly, agents traditionally don’t carry liability for their actions during the engagement on behalf of the client. Lastly, unlike lawyers (whose agency is qualified as “universal”), consultants and broker-dealers do not owe fiduciary duty to the client. This means that agents’ actions will not necessarily be driven by the best interests of the client. As a result of the above, both consultants and BDs may often be driven by self-interest in making as much money as possible from the engagement with the client. This may mean extending the consulting relationship for longer than is truly needed, or getting any deal done regardless of whether it’s the best deal. Both consultants and broker-dealers will likely continue working on numerous engagements and with numerous clients at a time (although this is less likely in the case of the individual consultant). The final, and probably most important, similarity is that neither consultants nor BDs work in long-term alignment with the company. The differences between the consultant and the broker-dealer are significant, however. A primary difference is available resources. An individual consultant, as the name implies, is most often a one-person show. A broker-dealer is typically an organization, which brings to the table a team of people, a wider breadth of expertise across several topics, and a greater depth of market knowledge, both from the financial and strategic investor standpoints. Another significant difference is who is actually doing the work. A consultant will most likely be doing the work personally, and therefore the client will get the senior person interaction as well as representation from the consultant. With BDs, it is not unusual for more junior team members to become the primary contacts and drivers of a deal. This is not universal, and if the size of the BD is small, the step-down from “senior” to “junior” banker may be limited. The most striking difference, which we touched upon above, is compensation. Consultants can’t legally be compensated on a success basis. Otherwise, this creates a risk that even a successfully closed transaction may be annulled by the SEC and the funding be returned to investors. BDs can be compensated on a success-fee basis and most prefer this business model as it allows them to command higher fees. One of the benefits of hiring a fundraising consultant is that the company can select a very highly customized skillset. Although it may be harder to find, clients can recruit specialists for the specific objective they would like to accomplish. For example, my former client hired me to be their interim CFO because they required reverse-merger and subsequent capital raising experience—a combination of transactions I worked on in at least three other occasions. Another benefit of working with a consultant is that they work directly with senior management and presumably, being a seasoned executive themself, can deliver the quality of advice that only senior-level professionals would be able to provide. Several years ago, I consulted with an aspiring manufacturer of generic biologic drugs (a.k.a. “biosimilars”), which sought tens of millions of dollars for a new insulin manufacturing facility. Their strategy was to pursue FDA approval and the plant financing concurrently in order to accelerate the path to market. I recommended a staged approach: Meet with the FDA first to confirm the approval path, raise equity for the FDA clearance and then seek less/non-dilutive financing for the manufacturing plant. Such a strategy would have added six to nine months to their path-to-market but would have avoided massive dilution to the scientific founder. Other benefits of consultants include the costs and ubiquity of the resources they bring to the table. Costs are fairly visible in real time, they are capped by the number of hours (or some other measure of work), and they tend to be lower in absolute dollar terms than success fees. Smaller clients can rely on fundraising consultants as a flexible human resource to help with non-fundraising tasks. They can be onboarded quickly, and separation can be done rapidly without significant “strings attached” (see ROFR below). For the next round of funding, the company can hire the same consultant or choose another one. Moreover, the adaptive nature of the consulting engagement often allows the company to recruit several contractors at a time with complementary skill sets. For example, I consulted once for a blood products company that had me work on securing angel and early VC funding, while another consultant was working in parallel to secure grant funding. Among the meaningful drawbacks of working with a fundraising consultant is the cash cost. Consultants tend to be expensive hires compared with traditional employees as their rates often price in the in-between-client idle periods, which make them as much as 3x as expensive as a part-time or full-time employee. Cash payments made to consultants are not a guarantee that they will result in a capital raise, nor is there a refund if the consultant is unsuccessful. Another drawback relates to unproductive onboarding time. Every consultant has to invest time in learning about the company’s history, culture, and management working style. And the company has to carry the expense of this less than fruitful period of the engagement. I consulted with a Canadian healthcare IT company who chose to simultaneously hire three different consultants to drive their capital raise. One month into the engagement, however, one consultant was still sending the CEO diligence questions and had yet to make an investor call. Clearly, that consultant was not a good “cultural fit,” whose engagement was terminated into its fifth week, but the company had to pay his billable hours. This risk pertains to re-engagement as well—the next time the company needs the consultant, they may not be available, meaning the client has to pay for another consultant’s learning curve. Further to the above, unless there is an explicit “success-tied” incentive put in place, which may not be contractually documented (otherwise, the SEC may interpret it as “success fee”), incentives may not be aligned. Hourly/retainer consultants might not be motivated to get the deal done fast. Most broker-dealer firms are fairly sizable operations. Even small BDs tend to have several professionals on staff. For example, when I worked in the Equity Private Placement Group at Cowen, a deal team could reach seven people from several product and industry teams. This can be a significant benefit since the breadth and depth of experience brought to the table are relatively large. The BD team size typically means support personnel may be available in tackling time-consuming, laborious, and otherwise expensive tasks such as industry research or drafting management presentations with exquisite graphics. The strong reputation of a BD can benefit the company because it will add credibility to the capital raise. Regulators require broker-dealers to conduct a certain amount of due diligence before taking on a client. Hence, a capital raising engagement sends an implicit message to the investor community that the BD has done its homework (e.g., pressure-tested the technology, validated current or prospective customer relationships, tested the marketplace, etc.) to confirm the business has a viable chance of success. Working with a BD, a company can reasonably expect to have a wider investor outreach. Simple algebra—two or three people on a deal team can reach more investors within a given timeframe relative to one fundraising consultant. Moreover, because BDs calling officers maintain regular contact with investors on multiple deals, they may get their calls returned quicker and get to pitch investors live (vs. a voicemail). While hard to assign a value to, investors know that BDs provide deal flow and will cooperate in order to keep the channel of new opportunities open. Once, while working in an interim CFO role, I requested our investment banker “play” the quid-pro-quo card and ask investors to increase the dollar amount they’d put in the deal—the financing size increased by $2.3 million as a result. I hoped the investors would respond positively in an anticipation of favorable treatment on the BDs next “hot” deal. Fundraising consultants, who work on only a few deals per year, are unlikely to have such influence over investors. A final benefit of working with BDs is that, because of the nature of the engagement and strings that come attached to it, on certain occasions, broker-dealers may take a long-term view of the capital raising process and help the company raise capital in phases: a small amount now (to help the business to get to the next value-creation milestone) and a larger amount in several months (one hopes at a higher valuation). Working with broker-dealers is not without its downsides. Institutional BDs are fairly sophisticated in marketing themselves. They tend to master twisting performance and league table stats to show themselves in a more positive light. Clients need to pay close attention to the sales technique and seek to identify fit and assess the quality of the team through the façade. Another downside of working with a broker-dealer is frequent lack of flexibility in marketing and/or deal structures they take on, even though they may claim that their solutions are tailored to each client’s individual circumstances. The BD’s business model is based on flow—the more transactions executed, the more fees they earn. Customized and tailored typically requires time, energy, and perseverance with investors, and often this is in conflict with the bottom line. BDs’ engagement letters often come with clauses that would implicitly give broker-dealers a meaningful say over a choice of financing structure. These include exclusivity clauses (a mandate that only one agent represents the client), tails (a period of time post engagement letter expiration that guarantees that the BD gets paid on the financing proceeds, even if they did not partake in arranging the financing) and ROFRs (right of first refusal to represent the client on their next financing, advisory, or M&A engagement). Working as an interim CFO for an immunotherapeutics company, I was negotiating with one investment bank whose signature structure was convertible debt with warrants. I continued to insist that we will not grant them tail and ROFR if they bring us any deal structure other than common stock. They walked away from the engagement. Working with BDs is expensive. In addition to the retainer, cash, and equity success fees, tails and ROFRs may commit the client to the banking relationships for years to come. One can argue that the success-based nature of the compensation balances the higher costs, but the flip side of this argument is that the success fee incentivizes the BD to rush to get a deal done versus getting the best terms for the client. More often than not, these terms are expensive. The choice between a fundraising consultant and a BD may be driven by a variety of objective and subjective factors, and the management team and the company’s board of directors need to make a determination based on the imperfect information at their disposal. The short-term implications should be weighted versus the longer-term ramifications, including the company’s ability to switch broker-dealer. Often, however, the stage of the company will be the primary driver behind the decision, with earlier stage companies often opting for individual fundraising consultants and later-stage companies leaning toward traditional broker-dealers. 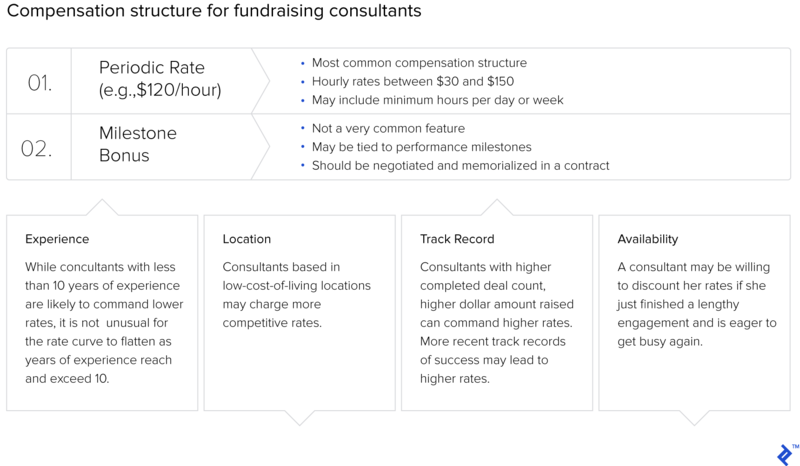 What is a fundraising consultant? A person whose end-goal is to raise money for a company. The scope of work typically includes development of collateral or investor-marketing materials. Other deliverables include financial projections, models, and valuation analyses. While the terms “broker” and “dealer” are often clustered together, each has its own legal definition. A broker is anyone engaged in effecting transactions in securities for the account of others, while a dealer is anyone engaged in buying and selling securities for his own account, through a broker or otherwise. What does it mean to be a broker-dealer? 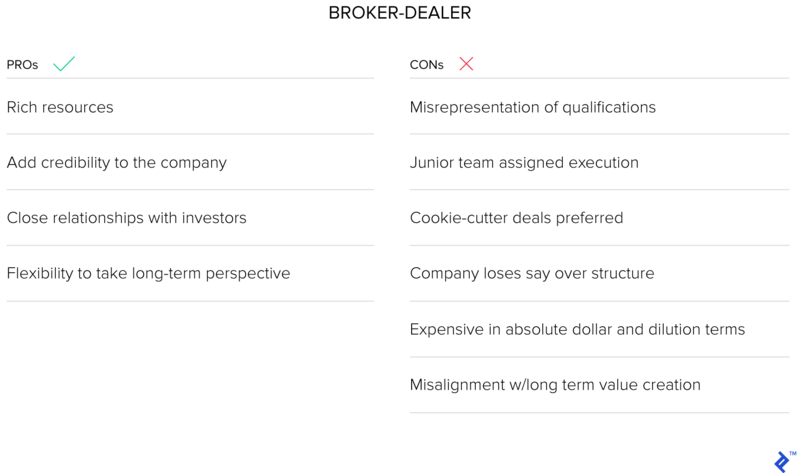 While brokers and dealers are technically two distinct figures, financial service providers emerged to act as both brokers and dealers, hence why the two have been combined into the figure of “broker-dealer.” Broker-dealers help companies raise money via securities sales.